A Lahaina ferry reported possibly striking a whale off Maui yesterday to the Coast Guard and the National Oceanic and Atmospheric Administration. At about 11 a.m., the crew of the ferry Expedition reported observing blood in the water and suspected they had struck a humpback whale. » Vessel operators should maintain a sharp lookout for whales and other collision hazards. Look ahead for "blows" (puff of mists), dorsal fins, tails, etc. Operators are advised to post at least one person dedicated to lookout for whales from November through May, the peak period for humpback whales in Hawaii waters. » Watch your speed. Thirteen knots or less could reduce potential injury. » Alert other vessels of whales that might be in their path. » Do not assume whales see you or will get out of the way. Calves are vulnerable because they are curious and have yet to learn to steer clear of vessels. » Plan ahead. Delays could occur due to whale encounters. To report a vessel-whale collision, call the National Oceanic & Atmospheric Administration hot line at (888) 256-9840 or the Coast Guard. For more information, go to hawaiihumpbackwhale.noaa.gov. A marine mammal response coordinator with NOAA boarded a Coast Guard HH-65 helicopter to survey waters off Maui for any injured whales, but none was observed, said NOAA spokeswoman Wende Goo. 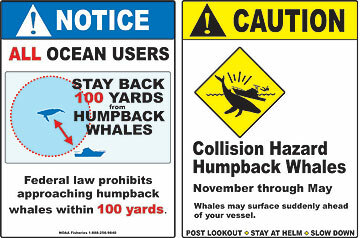 State officials, coincidentally, announced yesterday that they are installing signs at small-boat harbors across the state to warn boaters of the risks of vessel-whale collisions and to remind them of the federal rule barring anyone from coming within 100 yards of a humpback whale. "We're entering the peak period for humpback whales in our waters. From now through May, all ocean users should remember to take extra precautions to avoid vessel-whale collisions and close approaches," said Peter Young, chairman of the Board of Land and Natural Resources, in a news release. The signs are part of the Ocean Etiquette Campaign started by the Hawaiian Islands Humpback Whale National Marine Sanctuary to protect humpback whales and promote safe boating practices, according to their Web site. Officials will remove the signs during the summer when the peak period for humpback whales ends. Since December a few vessel-whale collisions were reported. On Dec. 28 a boat operator reported a collision with a whale off Kauai. A preliminary investigation indicated no injuries or blood observed on the whale, said Jeffrey Walters, co-manager of the Hawaiian Islands Humpback Whale National Marine Sanctuary. Two other possible collisions were reported off Maui about Dec. 29-30. Walters said a whale calf was observed with a pattern of cuts and scrapes on its back consistent with a vessel collision. At another spot off Maui, a researcher reported a young humpback whale had suffered a gash on its back. NOAA officials are investigating both incidents. Six vessel-whale collisions were reported during the last whale season. At least two of the collisions resulted in serious injuries to whale calves. » Kauai: Nawiliwili, Port Allen, Kikiaola small boat harbors. » Oahu: Hawaii Kai marina, Haleiwa small boat harbor. » Maui: Kihei and Mala ramps, Lahaina and Maalaea small boat harbors. » Hawaii: Honokohau harbor and Puako ramp.